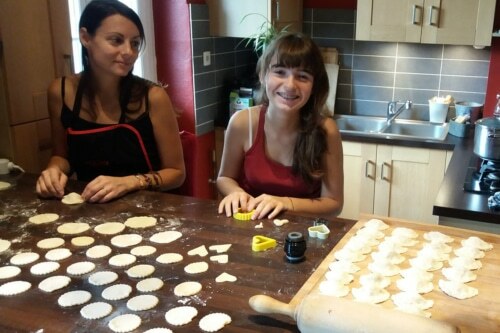 Experience an authentic French family immersion in Lyon at your French teacher Hélène, her husband Laurent and their two daughters, Manon (15) and Solène (13). You’ll dive right into their lives and improve your French while enjoying the beautiful and magical city of Lyon, famous for its gastronomy, mild climate and punctuated throughout the year by major cultural events. Bonjour, bienvenue à Lyon, bienvenue chez nous! My name is Hélène. I’m 40 years old. I was born, grew up and studied in the Paris area. I first studied German at university. Then I graduated in French as a second or foreign language. I taught French to foreign students for 15 years in private language schools and taught migrants in NGOs, including children. Laurent and I have been living in Lyon for sixteen years, and that’s where our two daughters were born. 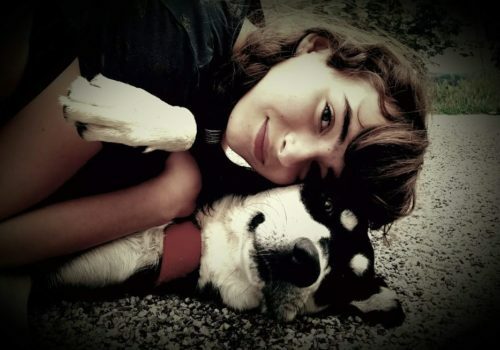 Manon (15) likes reading, drawing, painting, climbing and horse riding. Solène (13) plays the piano and has a passion for cinema, music and Asian languages. She is a Jackie Chan movies fan and loves K-pop and J-pop. 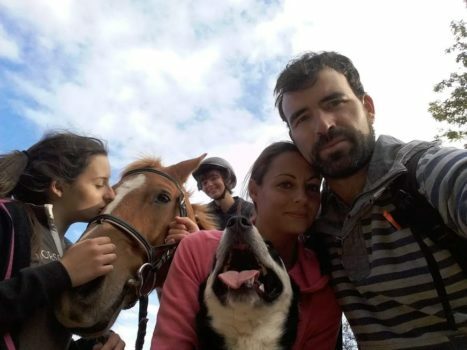 Laurent and I love biking and horse riding, hiking with our young and very cute dog named “Kickass”, kayaking, reading, spending time with our many friends. We are not fluent English speakers, but we manage. Laurent and I are fluent in German and Portuguese and we know a few Chinese words. Manon can speak Italian well and Solène has been learning Japanese for two years. We are interested in foreign languages and we love discovering other cultures through our travels or meetings. My family and I are very excited about opening our door to you and sharing our way of life. We are also delighted to meet you and share with you happy, truly sincere and hopefully unforgettable moments. For a more effective language immersion, I would advise you come on your own. However if it would make things easier for you, you could come with your partner. Whether you are a beginner or confirmed learner, I will offer you lessons tailored to your needs and expectations. I am used to adapting the classes to each student’s profile. Welcome to Our Apartment in Lyon! 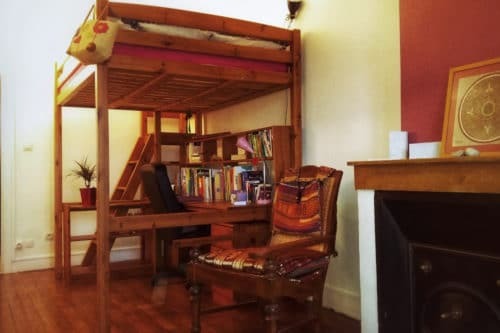 We own a comfortable apartment in a popular, commercial and lively area in an old, typical, two-story building, with a shared garden. There are plenty of shops and commodities in the vicinity, including public transportations. Lyon’s town center is easily reached by bus (15-20 minutes) and there are bike-hire stations too in the area. Parking is easy and free. We live on the second and last floor in a small building without elevator. We have a quiet duplex apartment with nice open floor space. 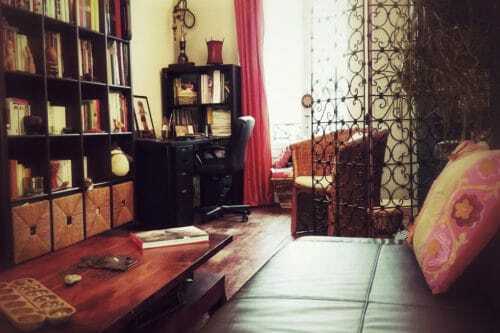 First is the living room with a bookcase and home cinema, and a comfy couch to relax. 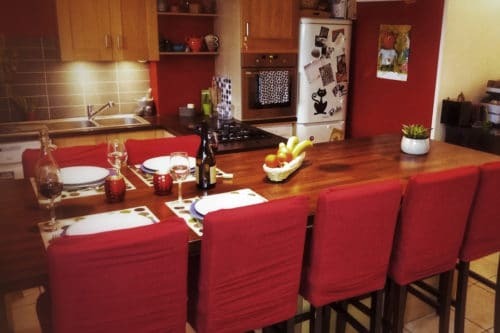 Next to the living room is our kitchen/ dining room where we spend a lot of time each day, to prepare and share our meals for the 4 of us or with our friends. 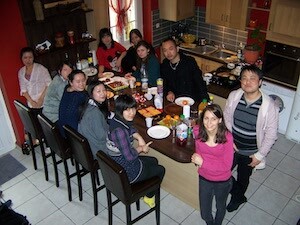 We like cooking traditional, regional French food and exotics dishes as well. We pay attention to the origin and the quality of the products we buy. Friends often show up unexpectedly. Having vegetarian or gluten-free friends, we are used to providing meals suited to everyone’s dietary needs. 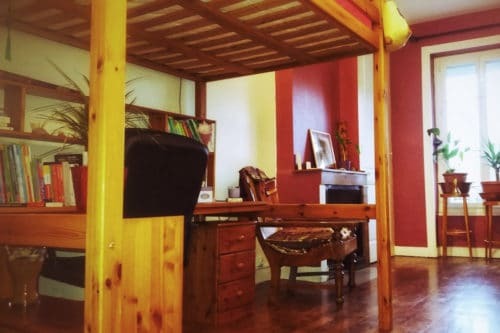 Your room is also on that floor and has a double loft bed, with a large desk under the bed and a high wardrobe. It features large windows and rolling shutters. We can provide you with a small fridge (quiet/ 41 dB), in order to put in some food or beverage, if needed. There is also free access to Wi-Fi. Your private shower room including WC is located right next to your room. All our bedrooms and private bathroom are located on the top floor. Last but not least, here is the garden we share with the other flat in our building. We are there quite often, have barbecues down there with our friends, and also hang with our dog. As you can see, there’s a nice swing set… It used to be my girls’ domain! Our dog “kickass” is a big part of our family. He is super friendly to adults and kids alike, and he is a patient listener: the perfect companion to help you practice your French! 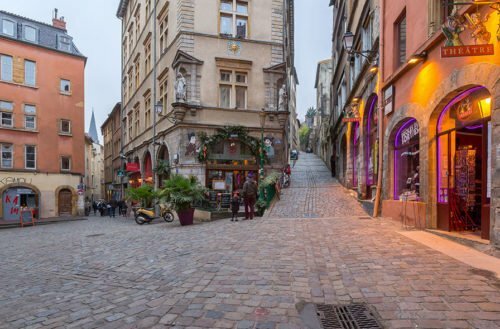 The main gateway to the Alps, Lyon is a World Heritage city, well-known for his large Renaissance old town called “Le Vieux Lyon”, where you can walk through semi-hidden passageways called “traboules” who connect some streets with each other. Very exciting! Founded 2 000 years ago at the confluence of the Rhône and Saône Rivers, Lyon built its fortune on the silk trade. 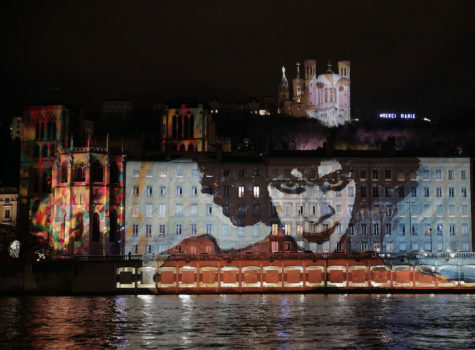 Lyon is also the birthplace of cinema, thanks to the work of the Lumière brothers. We can’t talk about Lyon without talking about French gastronomy. After all, Lyon is the home of world-renowned French chef Paul Bocuse. 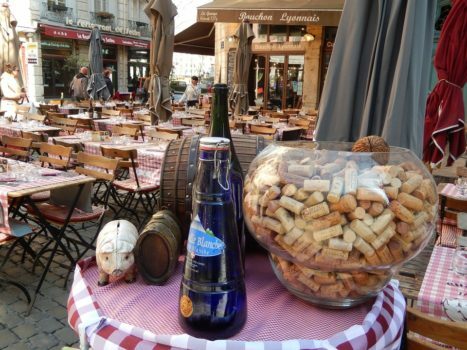 Some people say that Lyon is the world’s culinary capital, and I’m sure you’ll enjoy our typical restaurants called “les bouchons”. 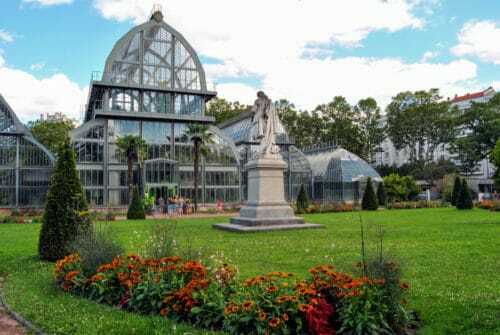 Lyon is also a great place to walk, or ride a bike (there are many bike paths) and just relax in a café or on the grass of our central parc, “le park de la tête d’or” and its amazing botanical garden and greenhouses. We’ve been living here for over 16 years, so I’ll be happy to help you make the best of your stay and take you to my favorite places. You can easily reach Lyon by plane, train or bus. You can then take a shuttle from the airport and the tram/bus or metro to come to our house. Or a taxi. We can also arrange to have you picked up/ taken to the airport for 50 Euros. You don’t need to rent a car, our area is well served by public transportation! But should you wish to, you will find free parking spots in our area. In addition to public transportation, you can rent bikes or electric scooters all over the city. There are several Vélo’V stations in our neighborhood. Because of our dog Kickass, unfortunately, we’d rather not welcome your pet. He’s friendly, but we don’t think he’ll enjoy sharing his home with another dog. Our flat is a smoke-free zone. 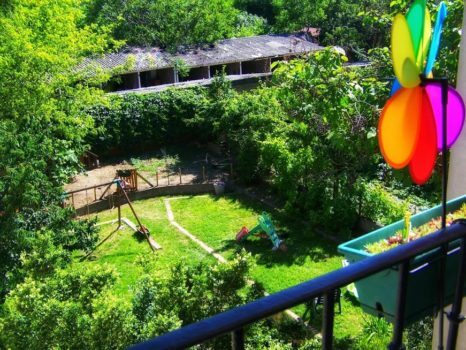 Should you wish to smoke, you can either use the balcony or the garden. This is what Laurent does! Half-board (2 meals a day): continental breakfast + lunch with your teacher or dinner with the family, your choice. You’re welcome to store food in our fridge, and cook your meal in the kitchen, however, there are also many food options around. We can also provide you with a small quiet fridge in order to put in some food or beverage, in your room if needed. 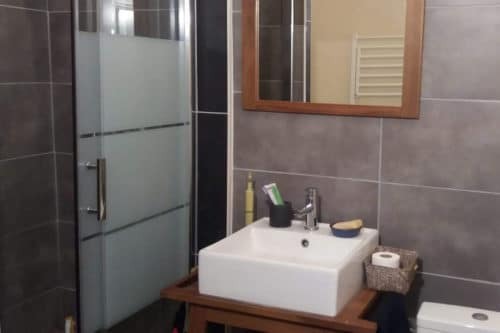 Accommodation in your own room with a double bed, desk and chair, dresser and your own shower room with bathroom sink and toilet. Sheets and towels are provided. Hair dryer available. 15 hours (one-to-one) French lessons per week, usually 3 hours in the morning over 5 days. Homework if you want some. Preferred arrival on Monday morning, departure the next Sunday afternoon – but I’m flexible and can adapt to your request. The fee for this program is 1300 euros per week for one person. For a more efficient linguistic experience, I believe it would be better if you came alone. However, you are very welcome to come with your spouse, a relative or a friend. Your bedroom with a double bed can accommodate two people. Depending on the weather, your interests, your mood and what you would like to do, I can organize longer excursions for an additional fee: the Northern or Southern Rhone Valley and its wineries, Valence, Annecy, some days in the Monts d’Ardèche natural regional Park, a small mountain where we own our country house, the medieval town of Pérouges, horse riding around the Miribel lake or in the mountains near Lyon, French cooking workshop, or other! There is so much to do around here, just tell me what you’d like to do, and we’ll work out the details! Follow Hélène’s Bilingual Articles On French Today, Where She Talks About Her Beautiful Region. A new teacher in the French Today’s team, please read the following comments from my ex-colleagues and students and recent international guests. Rest assured and come to Lyon. See you soon! 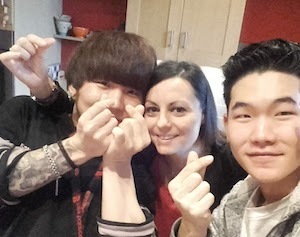 First things I would like to express my gratitude for your courtesy and hospitality during my stay in Lyon with my brother Seung Jae. Thank you so much for your help during our stay in Lyon. The lengthy discussions we had in Lyon were interesting and extremely enlightening. Thank you for the enjoyable time and your assistance. Your generosity has been greatly appreciated. Everyday positive atmosphere so, I was happy!! French and English are lack of study. I’m sorry but to communicate with me, you exerted yourself. I was very happy. 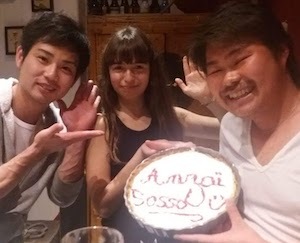 I didn’t also think I could celebrate my birthday in Lyon with some people so kindly like the members of your family. I thank the ideal family. I want to repay for your family for what you have done for me when Solen will come to Japan in several years. I am indebted to you for this five days. Thank you very much. You were kind to us, and you talked a lot about Lyon to us. We learned very much and it was very fun! We were glad we could meet you. Please come and visit Japan. At that time we will present you a guide to Japan. I’m looking forward to it. See you again. I love you! I’m ZHENG from China. I’ve studied in France for several years. Hélène, maybe your futur French teacher, is the first French teacher with whom I make close friend in France. I’m so lucky to have such a friendly, open-minded and easy-going friend like her which make her a very popular figure between my classmates. Learning with her, it’s one of my most memorable experience in my life. As an excellent linguistique teacher, she has a heart for young people and a caring heart. With her relaxing and also fun teaching method, the most difficult points become a very easy thing. In a word, we learned French through interaction with her in a fun classroom created by her. So it’s not tiring with such a brillant teacher. This is what I know about Hélène, if you want to know more about French people, culture and of course our star teacher more than I said, please join in our big family and give Hélène an opportunity to talk with you in French. I firstly met Helene in 2016. She was looking for an assistant to give FSL (French Second Language) classes in a public school. And that is how a “Dream Team” was found. We worked together for 2 years and I could absolutely say that Helene is a hard working and committed person. She loves her job and tries to find a personal approach to each and every student. She elaborates exercises so they would be interesting for students. 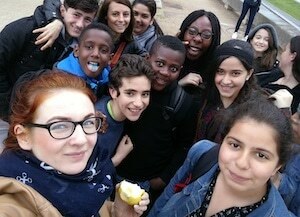 She also organised loads of events and meetings with writers, musicians, film directors… So students could learn the language and discover French culture at the same time. Helene, you are the best teacher I have ever met so far. Thanks for your help. Today, if I’m strong, it’s thanks to you. I’m sorry because sometimes I was really stupid. Now, I have changed, thanks to you.